Check out our interactive online viewbook for quick facts and student stories. Your Bay Path education is all about getting you “career-ready” and giving you what you need to compete in today’s ever changing world and workplace. 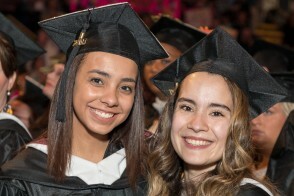 While we can't predict the future, we can tell you that when you graduate from Bay Path, you will have the knowledge and skills you need for whatever the future may bring. You will be an open-minded and adaptable thinker with the skills to analyze and solve problems and to work effectively with others. You will have both the knowledge and the hands-on experience to get started in your profession and the skills that will allow you to adapt to however that profession changes. How does Bay Path make good on this promise? The Residential College offers a 3-year accelerated degree option for many of our programs.The program allows students to earn their degree in 3 years of year-round study, enabling them to save on tuition costs and enter the workforce sooner. Continue on to one of our many graduate degree programs. You can earn your bachelor's degree in 4 years. For students in programs not eligible for our 3-year accelerated bachelor's degree we offer a 4+1 option. You can still continue on to one of our many graduate degree programs. You can earn your bachelor's and master's degree in 5 years. Get a jump start on your semester! The summer is a great opportunity to get a head start on your upcoming course load or take a challenging course off your semester schedule at a reduced tuition rate. You and every other student will have a personal support team consisting of a full-time faculty or a staff member who is your advisor for your major, a WELL advisor, an upperclasswoman who will be your peer mentor, and a career coach from the Sullivan Life and Career Planning Center (SCLP). Think of them as your own "safety net" whom you can count on to advise you, teach you and assist you—and to catch you before you fall and congratulate you on a job well done. Our Women as Empowered Learners and Leaders (WELL) Program is designed to give you the confidence you need to succeed, and help you find your purpose, passion and path to the future. WELL is a holistic and integrated experience that touches every piece of your Bay Path journey. There are four courses (10 credits total) that are the building blocks of the WELL program. You will be engaged in self-exploration that will be mapped to educational, career and life planning. All colleges give you a transcript - we go one step further. You’ll create a digital portfolio that will document your growth as a learner and a leader to share with prospective employers. Think of it as a digital diary that will hold your research papers, reflections on job shadowing or internships, awards and recognitions, as well as photos and videos.Your digital portfolio will be an album of your accomplishments that can be tailored to meet your particular career and educational needs. 100% of Bay Path University students participate in an internship, field experience or practicum before they graduate. Not 43%, not 75%; 100%. Many of our students complete more than one experience, enhancing their preparation for the future. Ask us about our 'funded' internship opportunities! The Sullivan Career and Life Planning Center (SCLP) provides students with thoughtful and intentional career planning for life. As a Bay Path student, you will have lifetime access to the SCLP and the services it provides, including one-on-one career coaching and mentoring, professional head-shots and access to our targeted network of potential employers. All of our full-time students receive a merit scholarship from Bay Path University, and more than 96% of our students receive additional financial aid that includes grants, scholarships and loans. In fact the average student financial aid package in 2017 was $27,274. Personal training and fitness center usage, laundry facilities for resident students, Direct TV for resident students, counseling services, career counseling, 1,000 pages of free printing each semester, and much more.